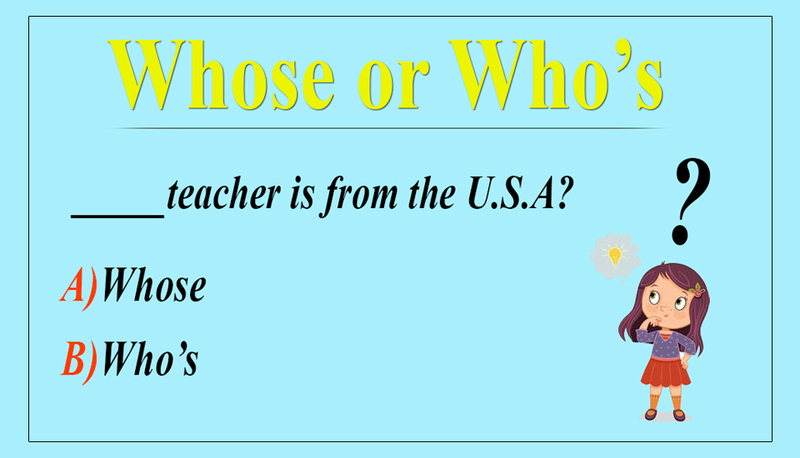 Whose and who’s are another two words that can be bewildering for ESL learners. In speaking they are pronounced the same, but when it comes to writing you might be uncertain about which one to use. You don’t need to worry about, learn in this article whether to use whose or who’s in your writing. The word “whose” is an interrogative adjective which is always followed by a noun while used in a sentence. It is used to show ownership or relationship. Whose house is near to the academy? Whose booklet is on the table? Whose brother learns English at Learn ESL academy? Whose teacher is from the U.S.A? The word “Who`s” is the contracted or short form of “Who is” or “Who has”. It is used to ask a question about the subject. Who`s the current president of the USA? Who`s happy about the new government? Who`s teaching the English class right now? 1- _______________ learning English at Atarud? 2- _______________ English is fluent? 3- _______________ coming late to class? 5- _______________ talking to you? 6- _______________ your best friend? 7- _______________ joining Learn ESL tomorrow? 8- _______________ afraid of death? 9- _______________ looking for a job? 10- _______________ in a hurry? 11- ______________ brother is a doctor? 12- ______________ jacket is black? 13- ______________ family lives in Kabul?